Once again, the Friends of the Fresno County Public Library will be hosting a local beer, wine, and cuisine tasting event this May 10 at the Woodward Park Regional Library. The event is held inside the library from 5pm to 9pm and features local breweries, local wineries, and local restaurants serving you a taste of what they have to offer! By your request, DJs Green Giant and Conor Miles are back to keep us entertained as we taste the fabulous fare! We will have a fun photobooth and pub-quiz style trivia! Come and join us for the second year of Brews & Vines in the Library! This event is for friends 21 and over, so don't forget your valid ID! 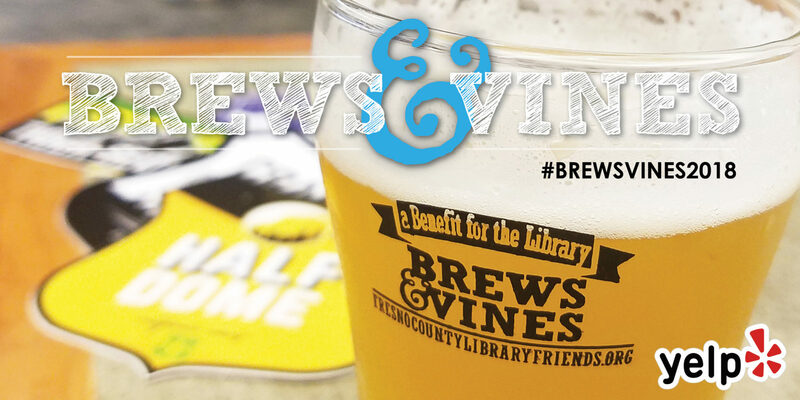 Tickets are now available for the 2018 Brews & Vines at the Library event to be held at the Woodward Regional Branch Library. Designated Drivers will have access to available food and soft drinks. Note: FOL Patrons and Library staff will receive a discount code to use during checkout. All proceeds benefit the Fresno County Public Library via the Friends of the Library. Purchase online tickets securely through Eventbrite. You will receive an email with your ticket. You may bring a printout of the PDF or show your electronic ticket at the door. We will have a limited supply of souvenir glasses commemorating our second Brews & Vines event. But they won't last all night, so don't be late! Eureka! Burger will be serving Do Good Distillery Whiskey!